Good morning to you! 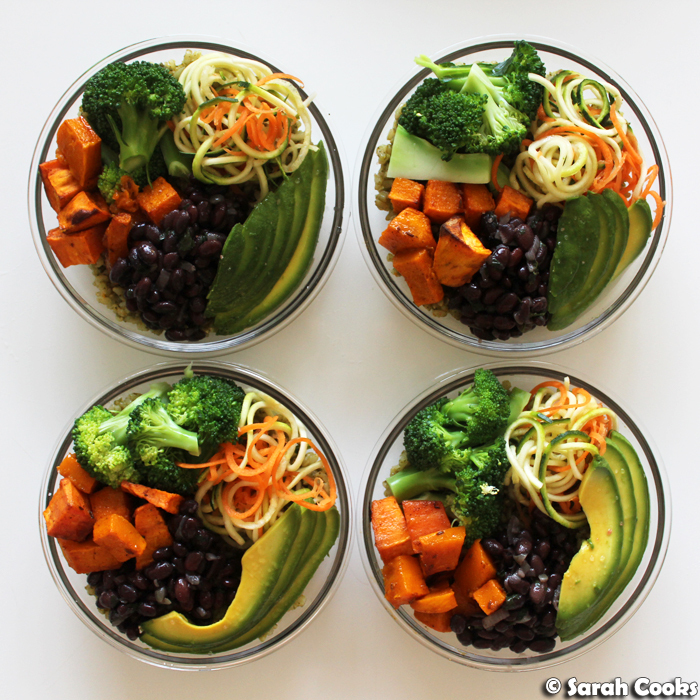 Monday is here and I have a sparkly new Meal Prep Monday post for you! We've got a rainbow romesco salad with crispy chickpeas and cheesy pesto chicken. All the bright colours! So much flavour! A double protein hit! Light on carbs but still filling! Let's do this thing. This salad component is basically a mash-up of different recipes from the Pinch of Yum blog - the rainbow power salad with roasted chickpeas, with the 5-minute romesco sauce instead of the suggested 5-minute magic green sauce. (I've tried the magic green sauce before, and it's fabulous, but I wanted to try something new this time!) I also added cheesy pesto chicken for funsies and to make the lunch more filling. 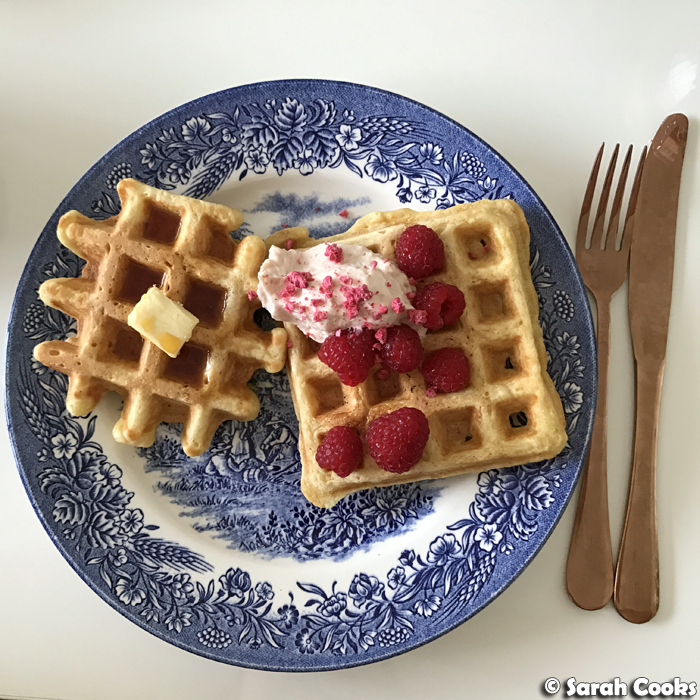 My foodie friend Clarice got me on to this great blog; she's made a bunch of recipes from there and really enjoyed them. 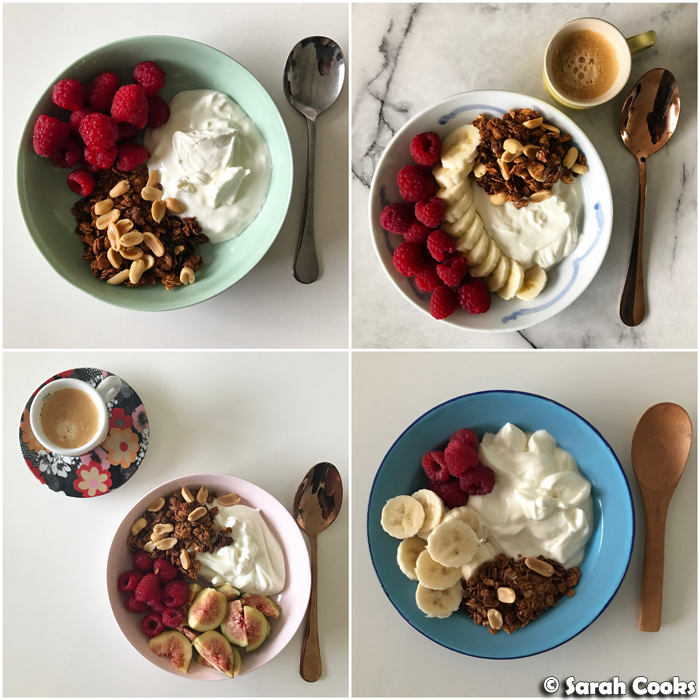 Pinch of Yum is super-popular on Pinterest, with lots of healthy and colourful recipes and, recently, some beautifully written, heartbreaking personal posts. Definitely worth a read! Let's start with the chicken. One of my favourite items from my long-gone obsession with Thr1ve was their char-grilled chicken topped with cheese and pesto, and a quick Google search led me to this recipe. 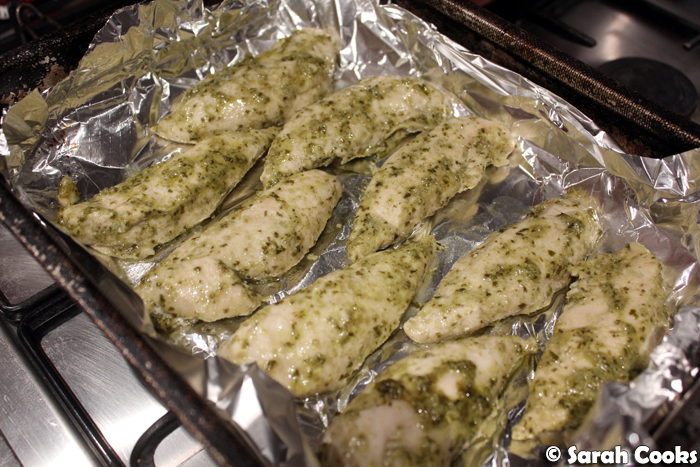 It's super easy - just coat some chicken tenders in basil pesto, and bake in a covered tray until almost cooked. Then cover in grated cheese and cook, uncovered, until the cheese is melted and brown. It's a great way to cook chicken, keeping it flavourful and moist. (After the first baking, the chicken gave off a lot of liquid, so I drained this off before adding the cheese. I didn't want a big soggy mess for my lunches!) However, if you were making the chicken to go with, say, pasta or rice, then I'd suggest keeping the delicious flavourful liquid. Anyhoo, here's a picture of the chicken before adding the cheese. 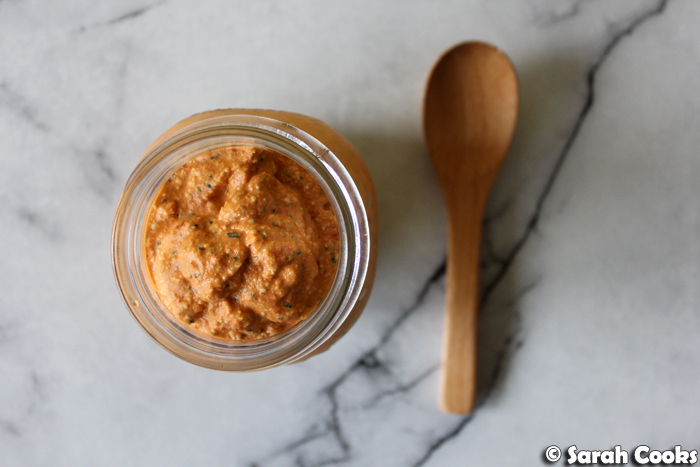 Now, let's talk about this romesco sauce! Pinch of Yum's romesco is a super-simplified version of the traditional Spanish sauce - just chuck a few ingredients into a processor and blitz. It was so incredibly tasty! And, with the main ingredients of this sauce being roasted capsicum and tomatoes, you're not just adding flavour to your meal, but also extra nutrient-rich vegetables. Heck yes! The recipe below makes more sauce than you'll need for four salads, so either scale down quantities, or make a big jar and keep eating it throughout the week. (I suggest making the big quantity, because it's So Good). Once you're done with the chicken and the romesco sauce, all you gotta do it roast some chickpeas in the oven, toast some pine nuts, and spiralize some zucchinis and a carrot. And that's the lunch! I chose to eat it with chopsticks - I just found it much easier to eat the zoodles that way. And because I was eating them like noodles, it made the lunch feel more substantial, as if I were eating actual noodles. I dunno, some weird psychological thing! 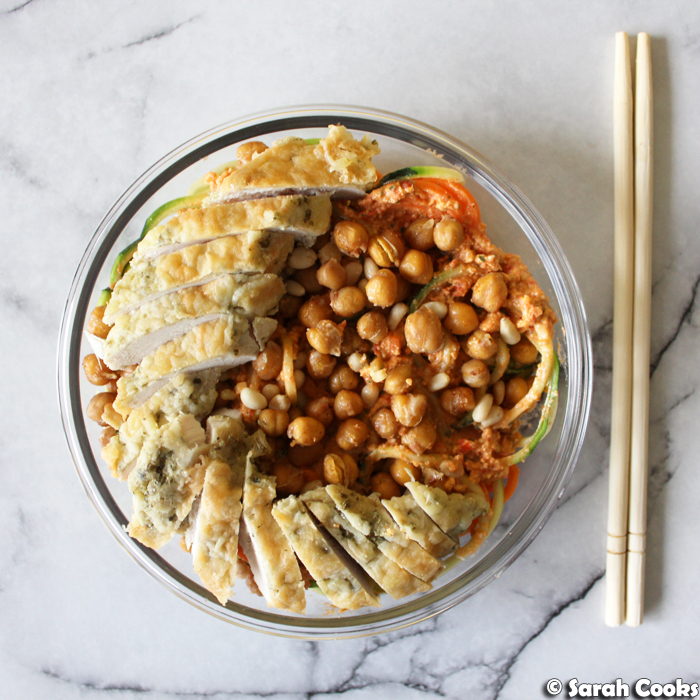 But whether you eat it with chopsticks or a fork, this lunch is seriously delicious. I loved it! 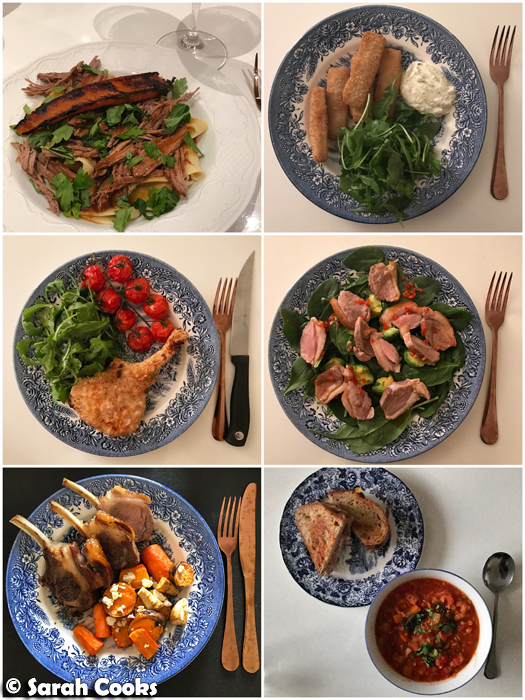 This meal prep also gave me a lot of great leftovers. That romesco sauce is good on everything! 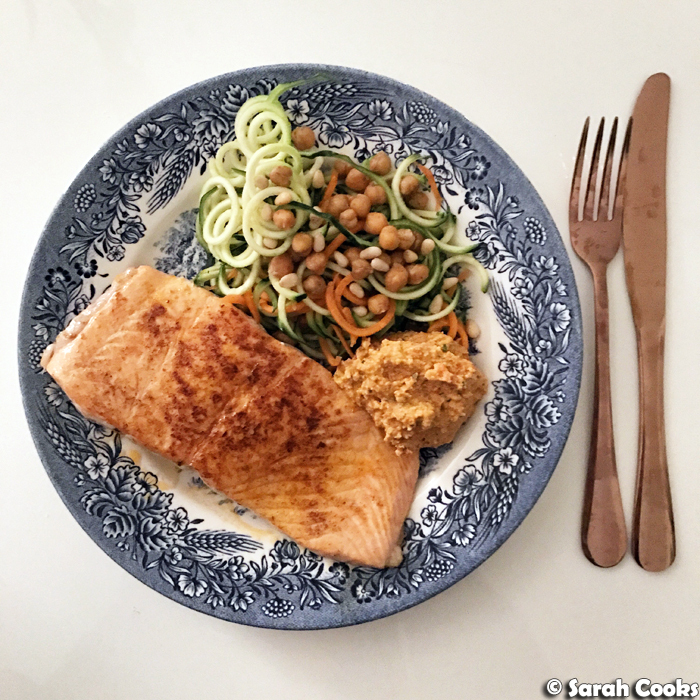 One night for dinner, I fried a piece of salmon (with paprika and lemon zest), and served it with extra zoodle salad and romesco sauce. 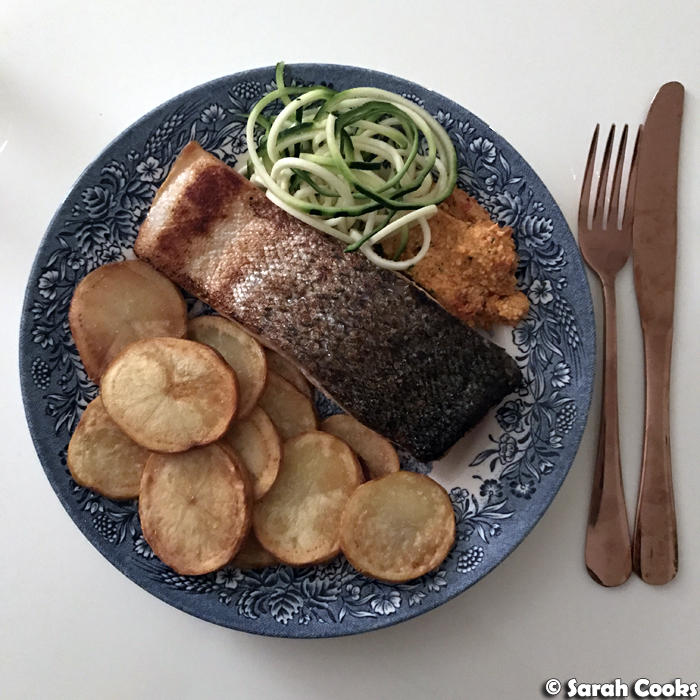 Another night, I added sliced fried potatoes to this salmon-romesco situation. 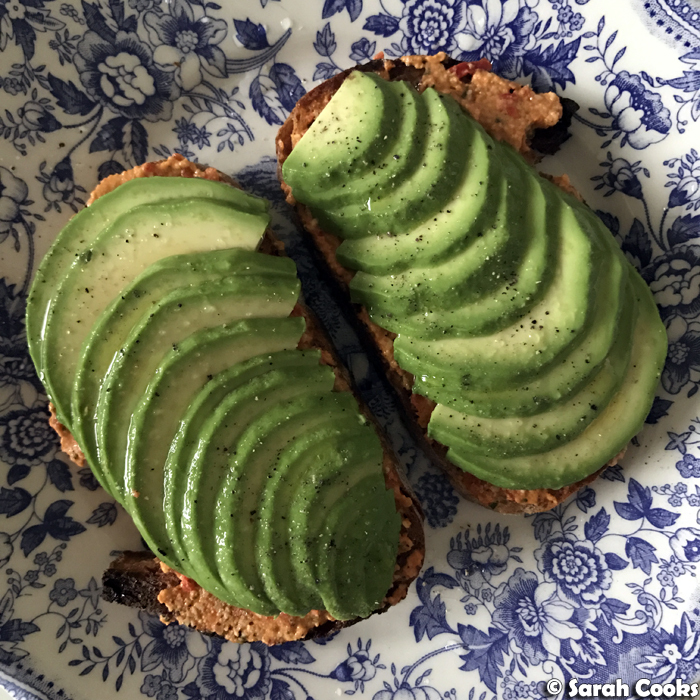 I pimped up one of my usual avocado toasts with some romesco sauce. 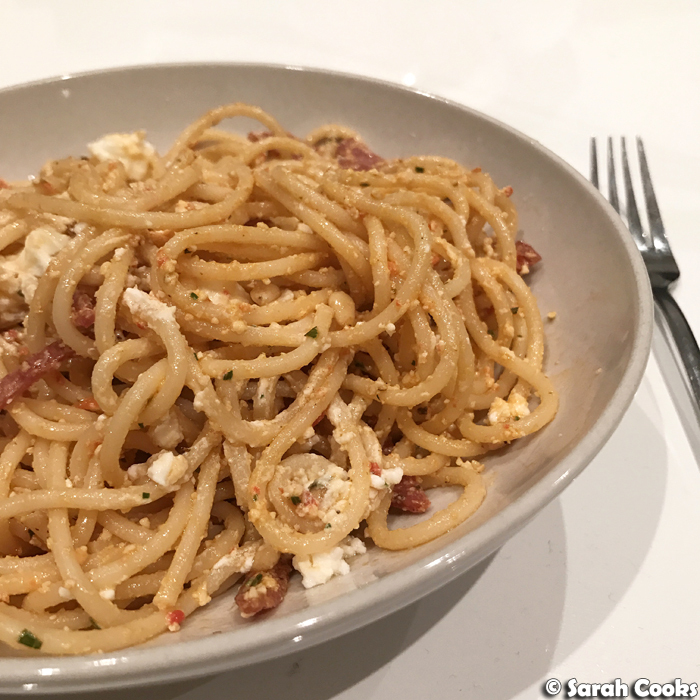 And another night, I used the romesco as a spaghetti sauce, adding salami, marinated feta, and toasted pine nuts. Fabulous! N.B. the below quantities make enough for four servings (with lots of romesco sauce leftover). Feel free to adjust quantities depending on your appetite! Place 3 small zucchinis and 1 peeled carrot through a spiralizer. 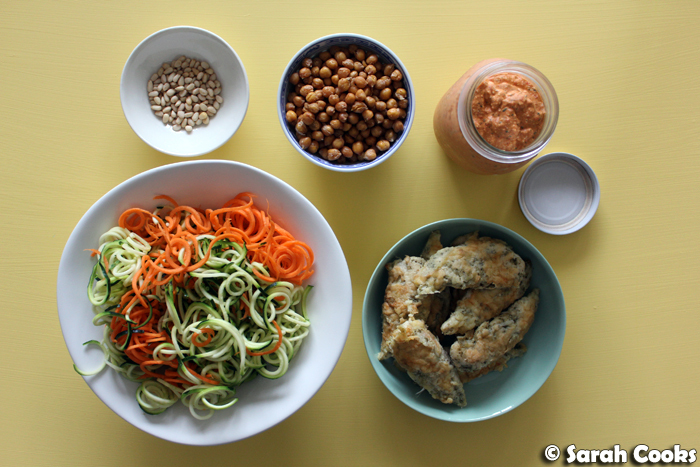 Stir through 1/2 cup Romesco Sauce, the Roast Chickpeas, (recipes below! ), and 2 tablespoons toasted pine nuts. For the dressing, blend together 280 grams roasted red peppers (from a jar), 10 cherry tomatoes, 1 cup raw nuts (I used half almonds half cashews), ¼ cup fresh flat leaf parsley, 2 tablespoons olive oil, 1/2 teaspoon salt, 1 clove garlic, and the juice of half a lemon. Taste and adjust seasoning to your liking. Preheat the oven to 200C. Drain a 400 gram tin of chickpeas and place in a baking dish with 1 tablespoon olive oil, 1/2 teaspoon chilli powder, 1/2 teaspoon cumin and salt to taste. Stir to coat. Bake for 30 minutes or until golden brown and as crisp as you like them. (I prefer a slightly doughy chickpea - cook for longer if you prefer crisp). Hey hey! Here's my birthday cake! For my birthday slumber party (the queen of all the parties), I really wanted to make something special, a really proper cake. Not a simple loaf cake, not cupcakes, not an elegant sunken chocolate cake, not a tart, not a pavlova, but a real birthday cake - all layers and fancy frosting and pretty decorations. (On reflection, I realise we didn't have birthday candles and we didn't sing - but I'm ok with that). So, which cake recipe? You may know that I'm just a little bit obsessed with Beatrix, in North Melbourne. 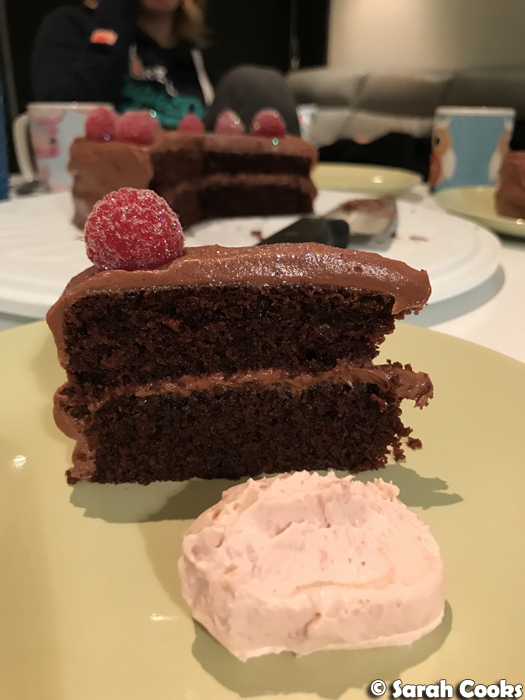 All their cakes are deeply fabulous, but a current favourite is Nat's cocoa sour cream cake with chocolate cheesecake icing. I bought a slice for last year's birthday, and it's glorious. So I used that idea as my starting point, and made a simplified (two layers only, not four), homespun version of her wonderful original. Flicking through my recipe books, I realised that I already have a tried-and-tested recipe for a cocoa sour cream cake - Nigella's chocolate fudge cake, from Nigella Bites, which I must have made at least a dozen times by now. It's good. It's real good. Decision made. So, then it was a simple enough matter of trimming the cakes flat and layering them with the icing. (Save the offcuts and eat them with leftover icing!) I actually thought it looked pretty decent with the icing just between and on top of the cakes, before I started adding icing around the sides. Perhaps I'll do it like this again in future, for a slightly less fancy occasion. 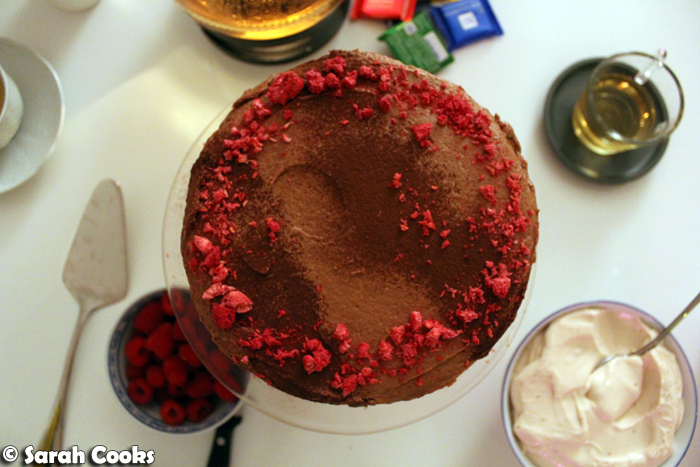 However, as you've seen in the top photo, I covered the cakes entirely in icing. For the decoration, I again stuck with the Beatrix theme by decorating it with some cocoa powder and a border of crushed freeze-dried raspberries. Lovely! So, cake is cake, and cake is great, but you know what else is great? Whipped cream. 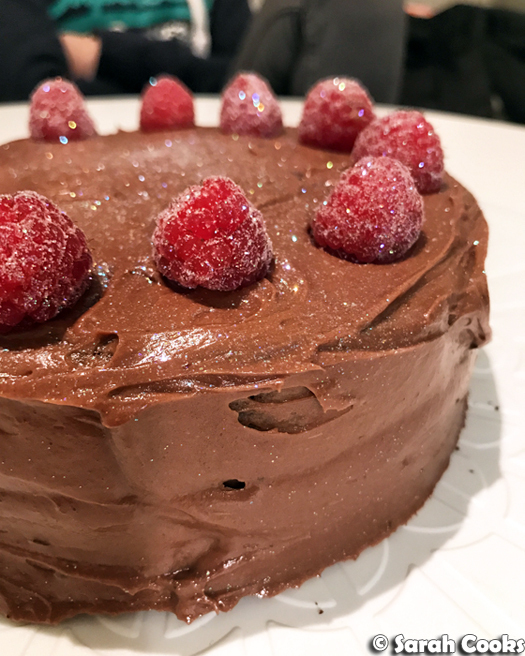 I found this recipe for Thick and Fruity Whipped Cream by pastry wizard Stella Parks on Serious Eats, and I thought it would be the perfect foil to the rich, chocolatey cake. (Can we take a moment to talk about how awesome Serious Eats and The Food Lab are? So awesome.) I'd never seen this type of whipped cream recipe before, and was also super intrigued by the method! 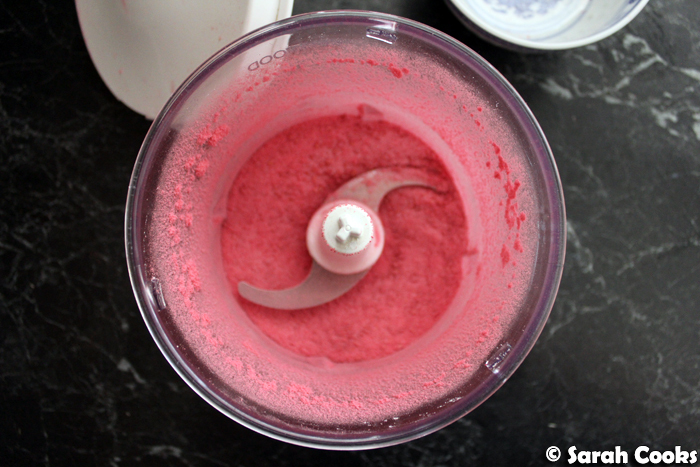 You start by taking some freeze dried fruit (I used raspberries), and whizzing it up with sugar. It forms a vibrantly pink powder. 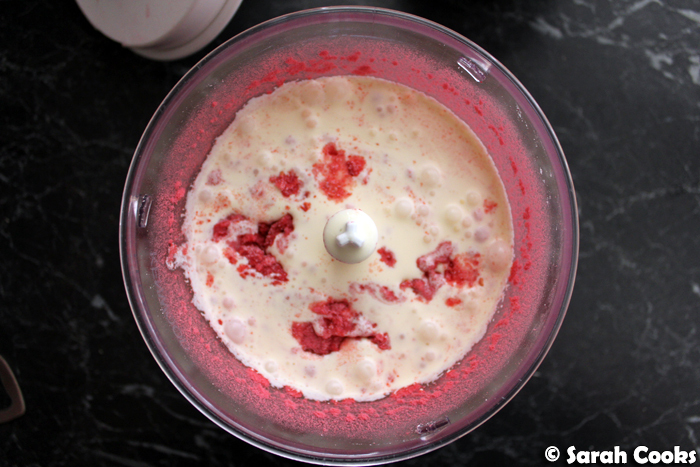 ...and blend it in a food processor until it forms a thick-and-fruity whipped cream! (Be careful not to overwhip it, otherwise it will turn into butter). Apparently this is the go-to icing for birthday cakes in Japanese bakeries. (I love this idea - stable enough to hold the layers together, but so much more natural tasting and delicate than a trad buttercream with food colouring). The recipe says that you can keep this for a week in the fridge, but we ate it all in two days. Whoops. It was so delicious! It had a lovely fresh tartness from the raspberries, and was so creamy, like a rich and mild Greek yogurt. (Actually, like my beloved Sahnejogurt from Germany - yogurt made from cream. Ridiculous). It offset the cake perfectly! And leftovers the next day were truly excellent on waffles. 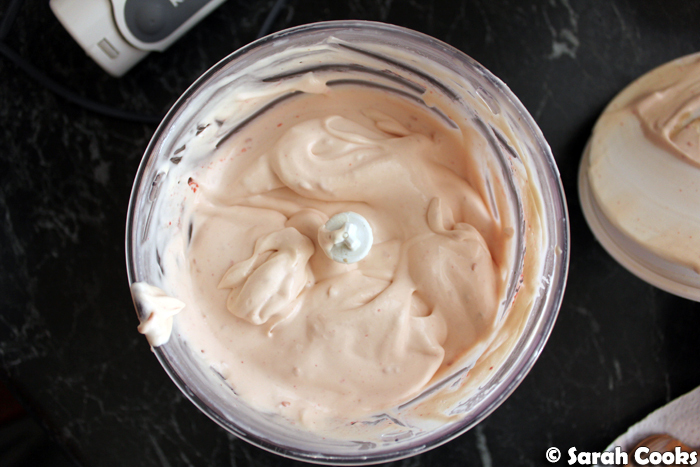 Look, I'm not saying you need to make this whipped cream to go with the cake, but I'm also not not saying that. 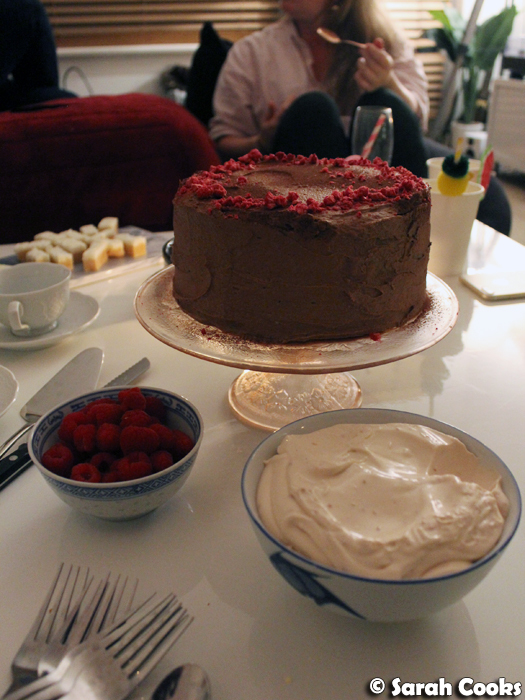 This was a really wonderful birthday cake - so many delicious components coming together into a special sweet treat. Here's the recipe. I hope you enjoy it as much as I did! Line 2 x 20cm sandwich tins with baking paper. 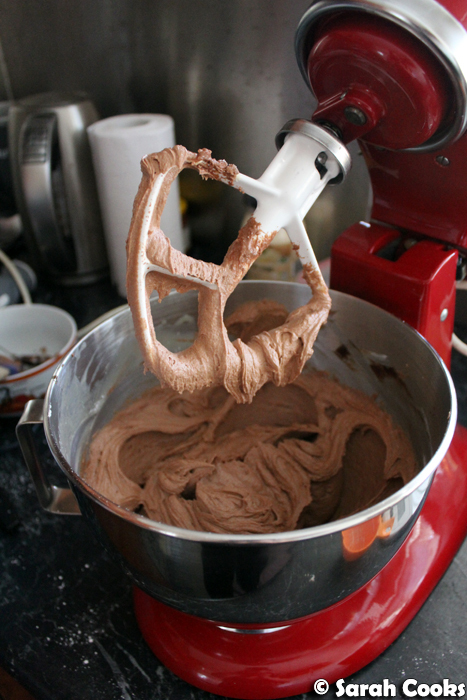 In a large bowl, mix together the flour, sugars, cocoa, baking powder, bicarb and salt. (If they're lumpy, I suggest sifting the cocoa, baking powder and bicarb). Pour the batter into the prepared tins, and bake for 50-55 minutes, or until cooked when tested with a skewer. 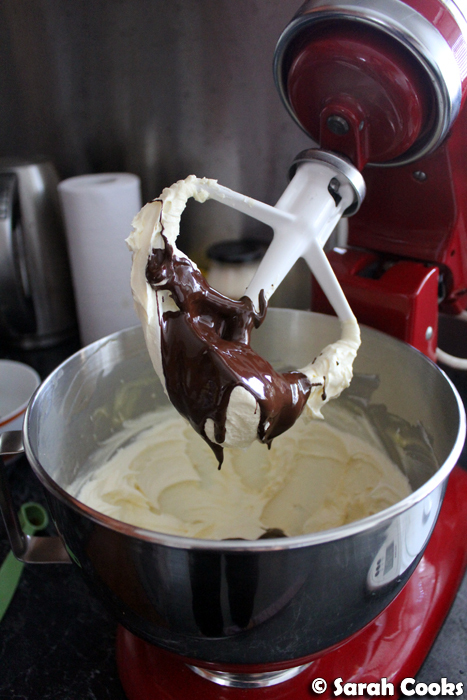 Beat the butter and cream cheese using an electric mixer until light and fluffy. Add the melted chocolate and vanilla, and beat until combined. Sift in the icing sugar and beat (starting on a low speed so you don't cover yourself in sugar!) until smoothly combined. 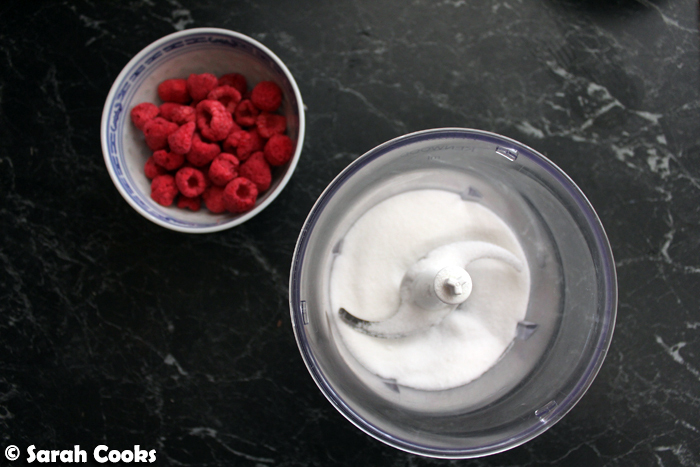 Place the freeze dried raspberries and caster sugar in the bowl of a food processor, and whizz until it becomes a fine powder. Add the whipping cream, and stir gently with a spoon to make sure no pockets of powder remain stuck in the corners. Pulse until thick and creamy, like Greek yogurt, less than two minutes. It doesn't take very long, so err on the side of caution! If you overwhip it will become butter. The cream also thickens as it sits. Use a serrated knife to slice the domed tops off the cakes. (Cook's treat! Eat these with any extra cream or icing you have - delicious). 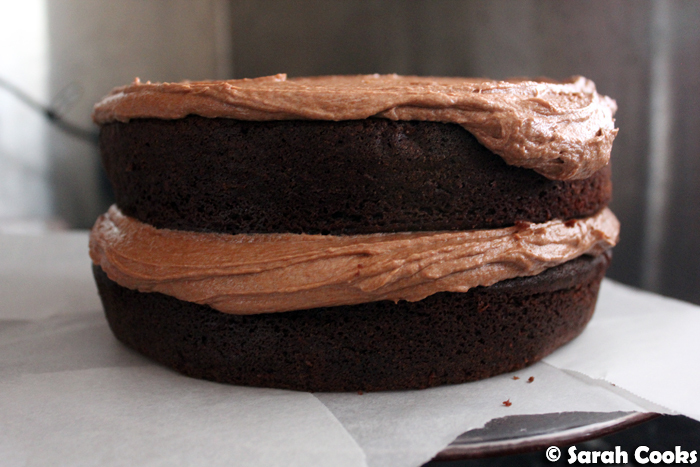 Place one cake on a serving plate or cake stand. Place four strips of baking paper underneath the cake around the edges. (This is to protect your plate from messy icing smudges). 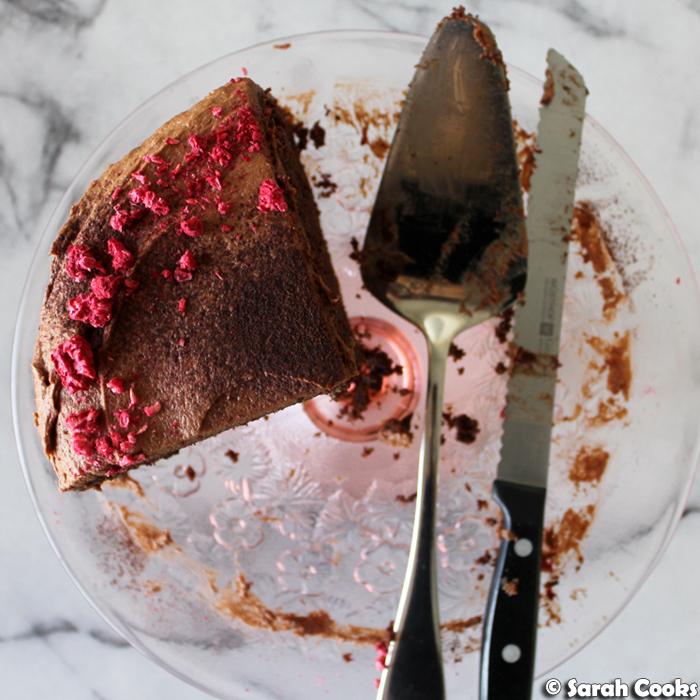 Gently remove the baking paper from underneath the cake - ta-dah, neat sides and a clean plate! 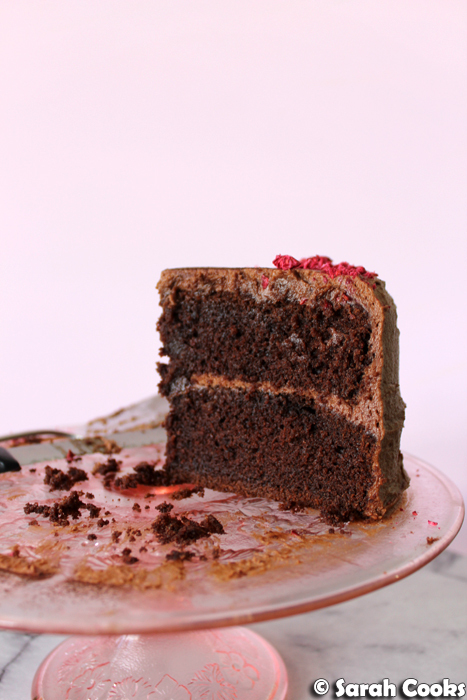 Dust the top of the cake with cocoa powder, and crush some freeze-dried raspberries around the border of the cake. 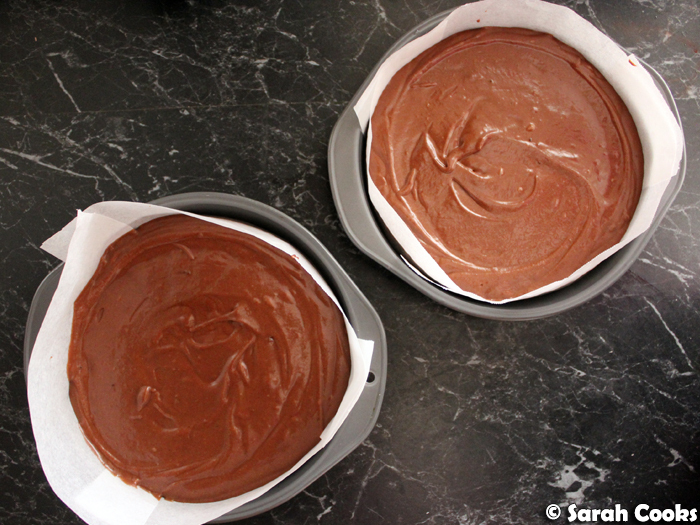 Place in the fridge for the icing to set before cutting into thick slices to serve. 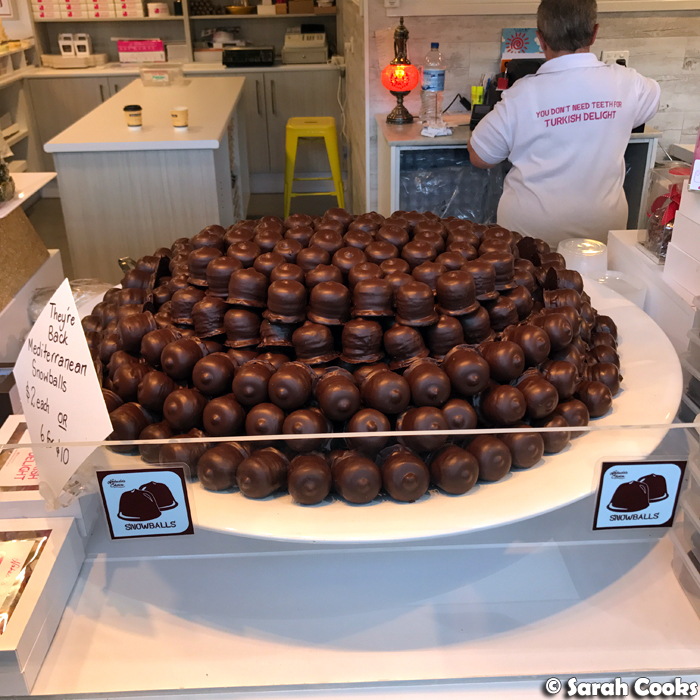 Edit (12-June-2017): So it's totally possible to make this cake in half quantities! I did it a couple of weeks ago for a (small) get-together. 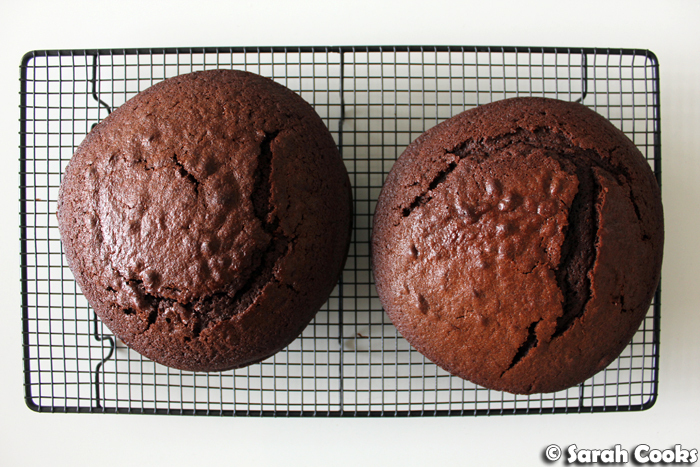 Just halve all the ingredients (use 2 eggs), and bake the cake in a single 18cm springform tin. Start checking for doneness at 40 minutes. Once it's cooked and cooled, slice it in half lengthways and decorate as per the above recipe. Edible glitter optional. (Not optional). Good morning! 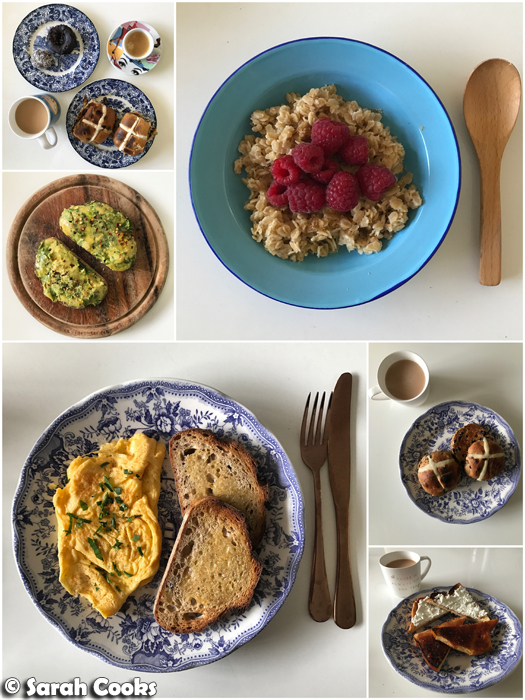 It's another Monday, and I have a Meal-Prep Monday post ready for you today! It's a super simple, super light Greek-inspired salad bowl. I made this when I'd been having a pretty indulgent week, and really wanted to balance it out with a refreshing, carb-less lunch. 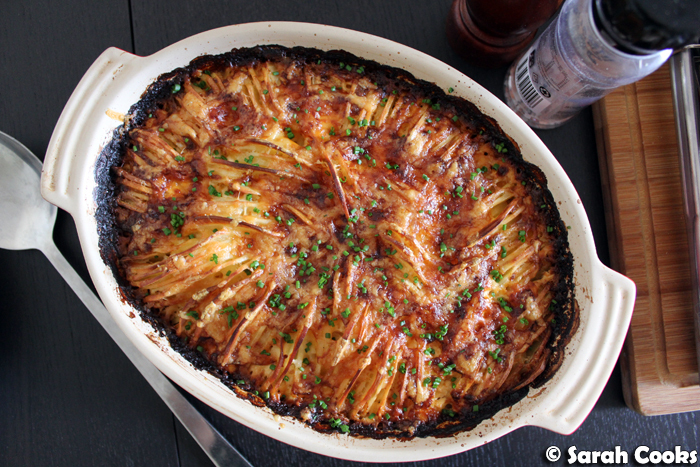 And this one can be made all with supermarket ingredients, and barely takes any time to cook. Winner winner! (Chicken... meal prep). 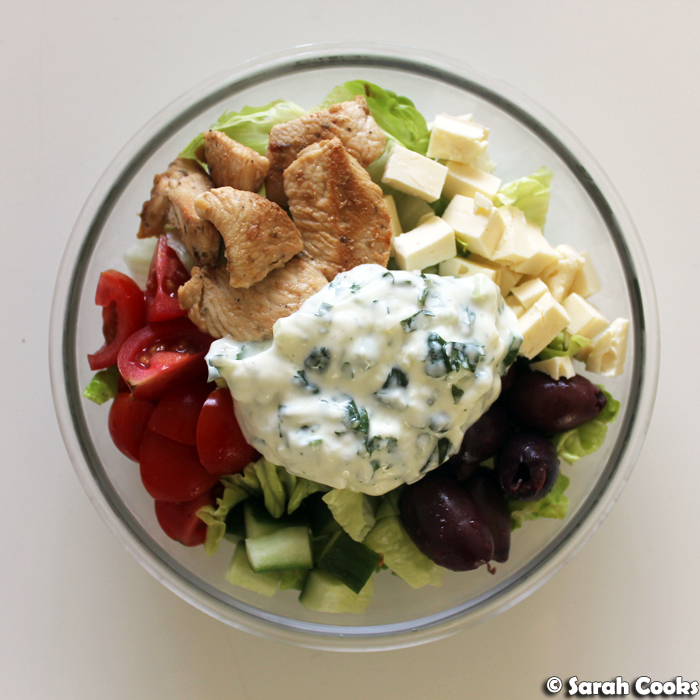 We've got crisp cos lettuce, marinated chicken, feta, olives, cucumber, cherry tomatoes, and a creamy tzatziki to bring everything together. A Greek Salad meal prep isn't a particularly original idea, but it is a particularly good one! Different versions are all over Pinterest. 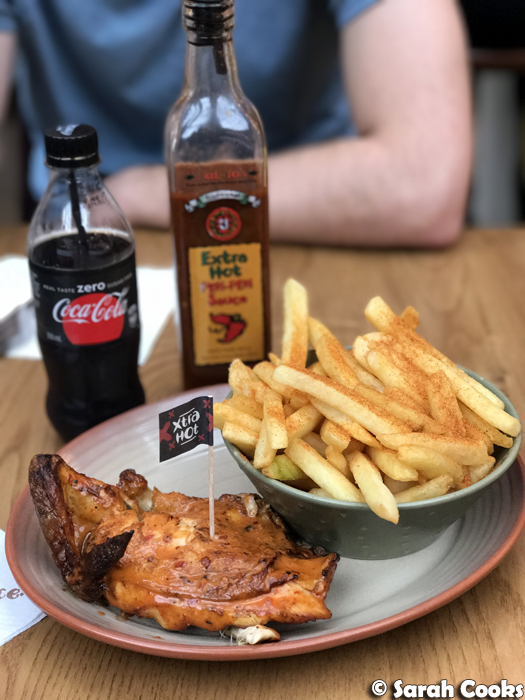 I got this idea from Eazy Peazy Mealz - I followed their chicken marinade quite closely, but just winged everything else. These are very easy to put together - you do have to marinade and cook the chicken, but apart from that all you have to do it a little chopping and stirring. I love how fresh and vibrant they look! This is an extremely light meal - as I said, I felt like a bit of restraint after a period of indulgence - but the chicken and Greek yogurt make it a bit more substantial. If you need something more filling, then I'd suggest adding some cooked-and-cooled rice or having a bread roll on the side. However, for me this was just perfect. As I work an office job and tend to sit for most of the day, I don't always feel like a huge lunch. (I just made sure I had enough healthy snacks on hand - apples, bananas and so on - to keep me going throughout the afternoon). The very tasty feta and olives made it feel like a proper lunch and not just a Sad Desk Salad. (I am reminded that Nigella, in the Low Fat chapter of How to Eat, wrote that strong flavours can make food seem more satisfying.) You know how some "healthy" meals can taste like self loathing and despair? Not this one. It was delicious! And I was looking forward to my lunch every day! Mix all the marinade ingredients together and stir the chicken through. Set aside for 30 minutes if possible. Cook in a hot frypan for 5-10 minutes, or until cooked through and golden brown. Set aside to cool completely. 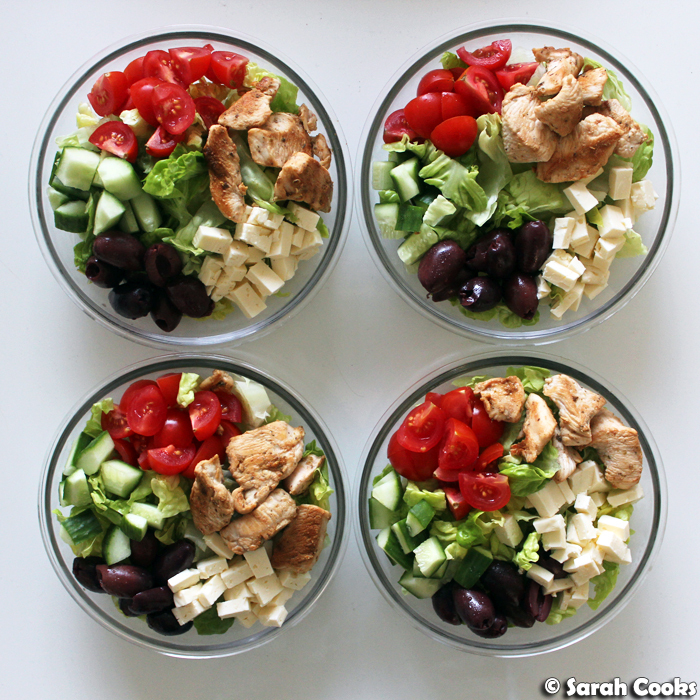 Divide the lettuce, cherry tomatoes, cucumber, feta, olives, and cold chicken between four serving containers. For the tzatziki, mix all the ingredients together. 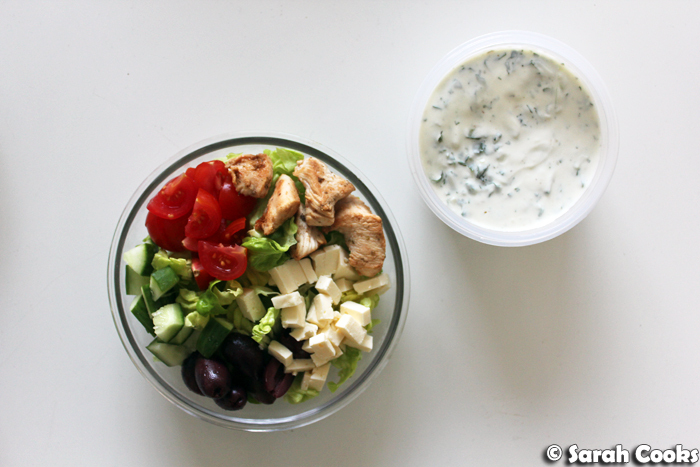 Place in a separate container, and spoon the tzatziki over the salad when you eat. Well hello there! It's certainly been a busy few weeks here in the world of Sarah - the last week of April was full of my birthday celebrations, and we've just finished two rather epic weekends in a row celebrating my dad's 70th birthday. Phew! It's been so fun but super exhausting. Things have finally settled down a little bit and now I've got some time to blog - hooray! So for today I want to tell you all about my birthday celebrations this year! As you may know, I prefer to do a few small events with different friends, rather than one big party - smaller groups are much easier and you get to talk to everyone properly. Let's take a look! The week before my birthday, we took advantage of the Anzac Day public holiday to have some friends over for a lunch at home. 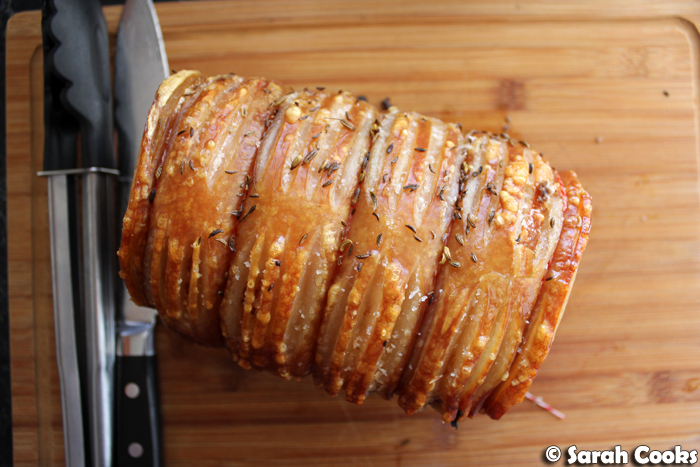 We made a roast pork loin with crackling, The Food Lab's incredible hasselback potato gratin, and a green salad with pear and toasted walnuts. Dessert was a huge plate of cookies! 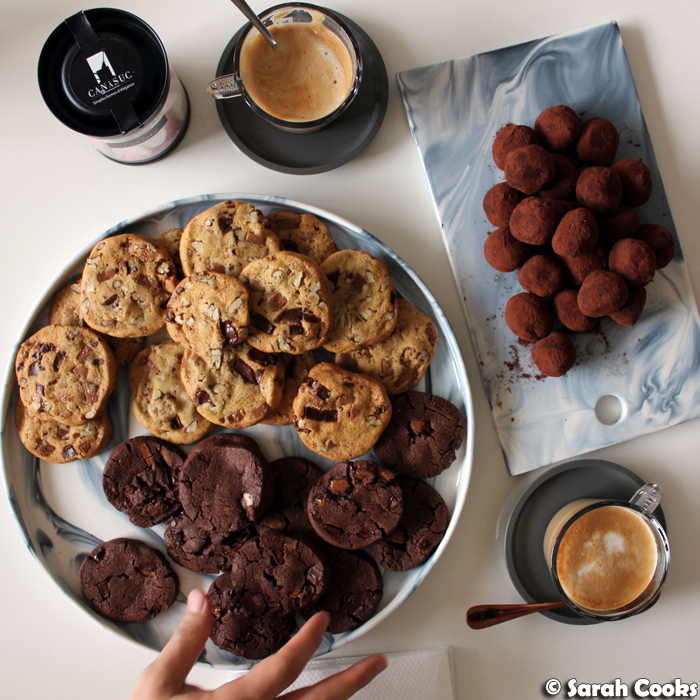 David Lebovitz' salted butter choc chip cookies and Dorie Greenspan's world peace cookies. Plus some rich dark chocolate truffles to go with coffee. So yum, such fun! Yay! 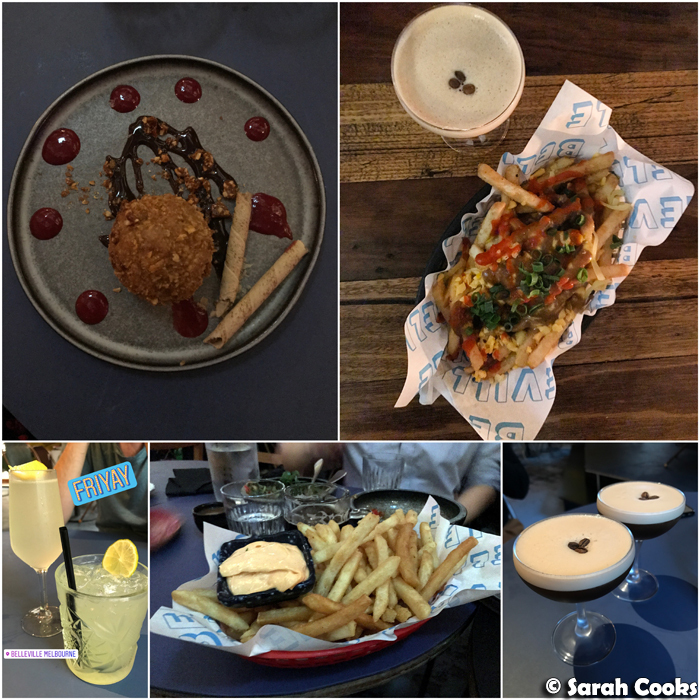 The Friday before my birthday, I had birthday drinks and dinner at Belleville (Globe Alley, Melbourne VIC 3000). I'd been there before (on an invite) and really liked it, and have popped in a few times since then for sneaky after-work cocktails and delicious poutine. It was a good choice! The food was tasty, and they were great with the group booking (10 people). They were able to accommodate a couple of number changes at late notice, and they kindly let us split the bill at the end of the night. Thanks guys! The next night, we hosted my annual slumber party. You know the drill, a group of girlfriends, comfy clothes, lots of food and drinks. 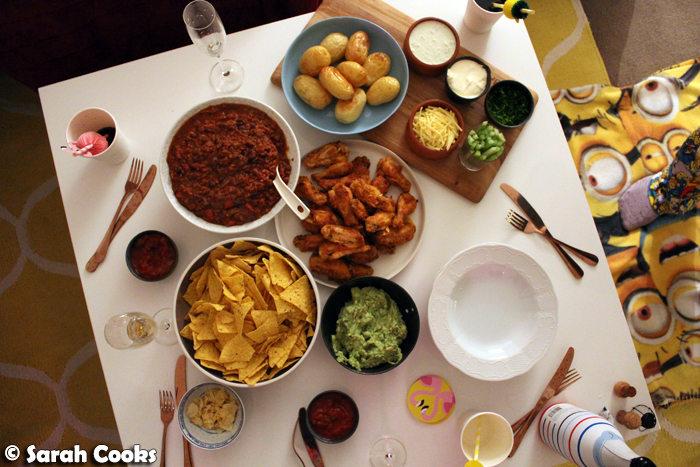 This year I went for an American comfort food theme - vegetarian chilli (Nigella's recipe from Feast), buffalo wings with blue cheese dressing and celery, baked potatoes and corn chips, with sides of salsa, guacamole, grated cheese, sour cream and chives. The recipes all worked really well, but I was surprised by how popular the buffalo wings were! (Assisted in no small part by our viewing of BD Wong's guide to eat chicken wings - he's so awesome). I hadn't made buffalo wings since the first time, six years ago, but I've already made them twice more since the party. Can't get enough! (Check out my buffalo wing recipe here). My actual birthday was a Sunday. It was a super lazy, chill day! Perfect. I made some waffles for breakfast. 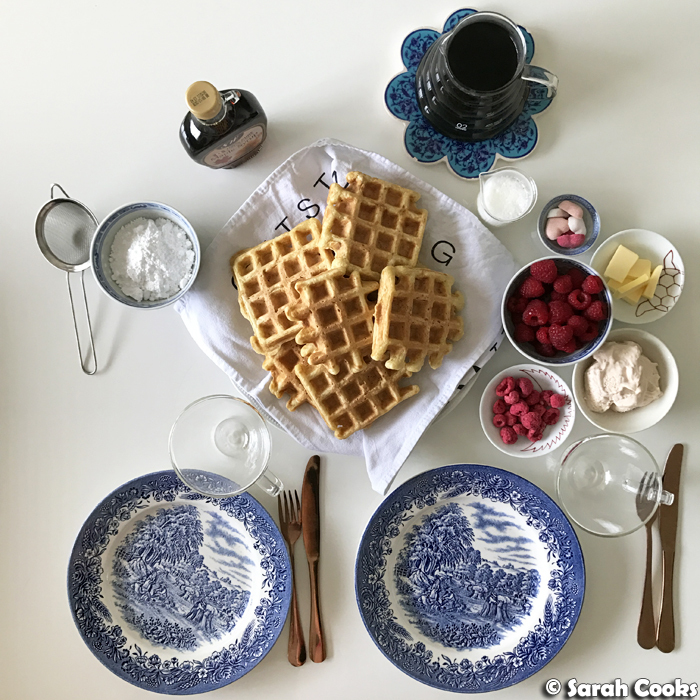 They were the waffles from The Food Lab, which I served with more of that stable raspberry whipped cream, raspberries (both fresh and freeze dried), butter, maple syrup, icing sugar, and a big pot of coffee. As is my family's usual tradition, we went out for a special birthday meal for dinner. 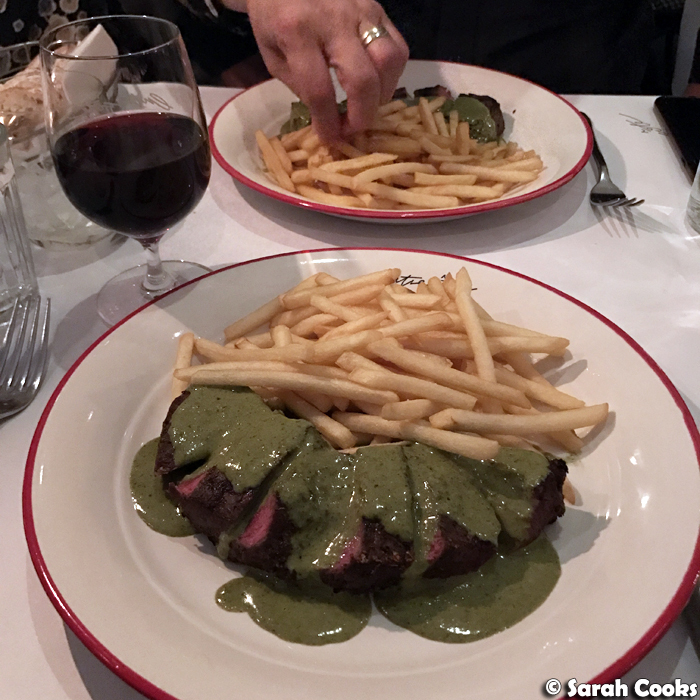 This year it was at Entrecôte (131-133 Domain Rd, South Yarra VIC 3141), for a classic French meal of steak frites. I'd never been to the South Yarra branch, and I'm happy to say the service was great and the food was excellent! They do what they do very well. 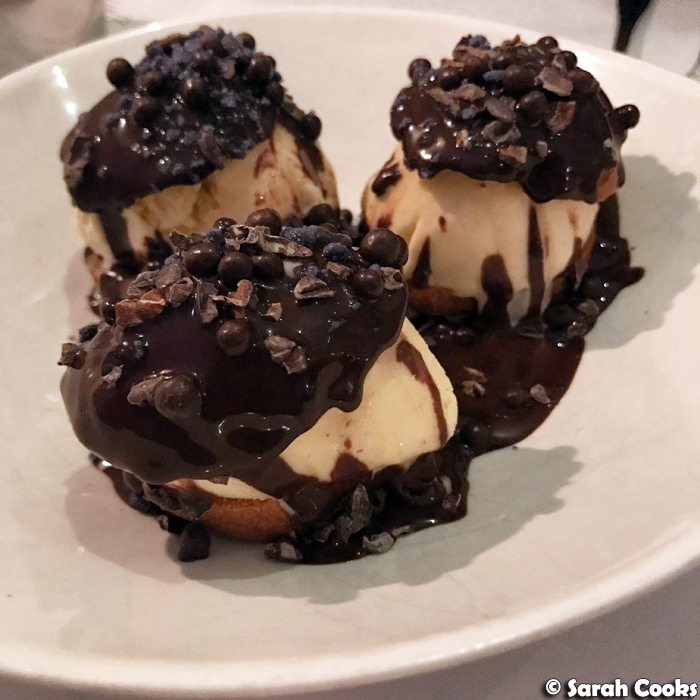 The escargots and profiteroles were also *mwah*. (Mimes kissing gesture). 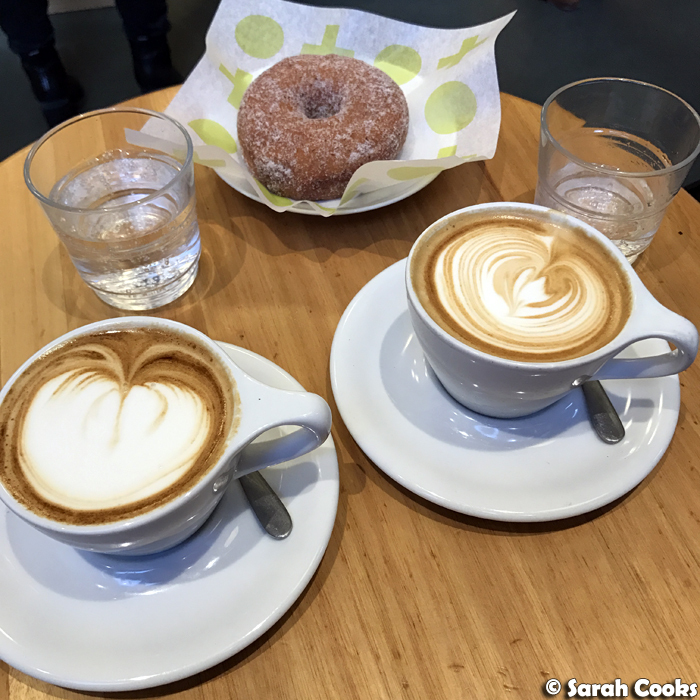 I sneakily stretched out the birthday celebrations a little further the next day, with my customary (second) breakfast of donut and coffee with my buddy James at Shortstop (12 Sutherland St, Melbourne VIC 3000). The simple cinnamon, cardamom and sugar is my favourite! And for lunch, my buddy Adam and I went to Tim Ho Wan (206 Bourke St, Melbourne VIC 3000). We'd tried to come here last year but the queues were too long for us to do in a lunch break. Luckily the queues seem to have calmed down since then, and we were able to walk in straight away! Woo-hoo! We ordered a bunch of things and were really impressed. 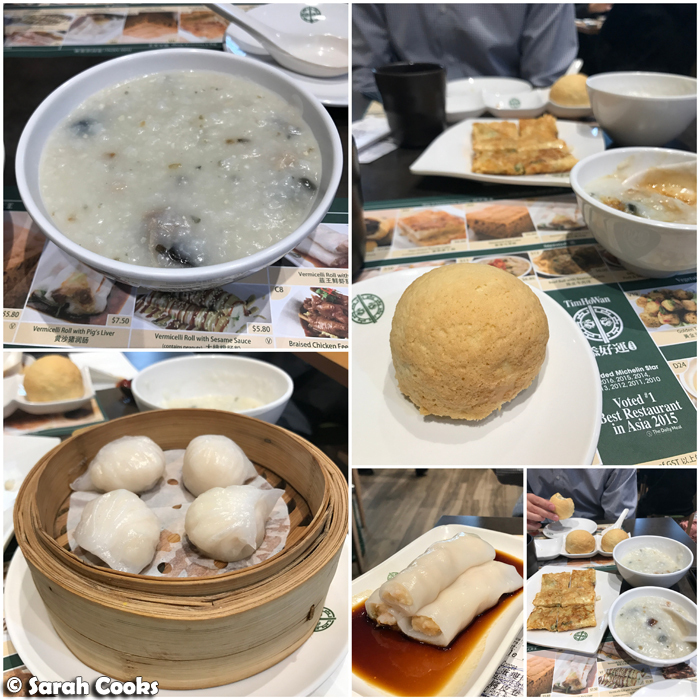 Of course, the signature pork buns were excellent, but we also liked the century egg congee, the har gow (prawn dumplings) and the chee chong fan (prawn in rice noodle roll). Definitely want to go back! And finally, I wanted to show you some of the gorgeous gifts I was lucky enough to receive. Flatlay skills! 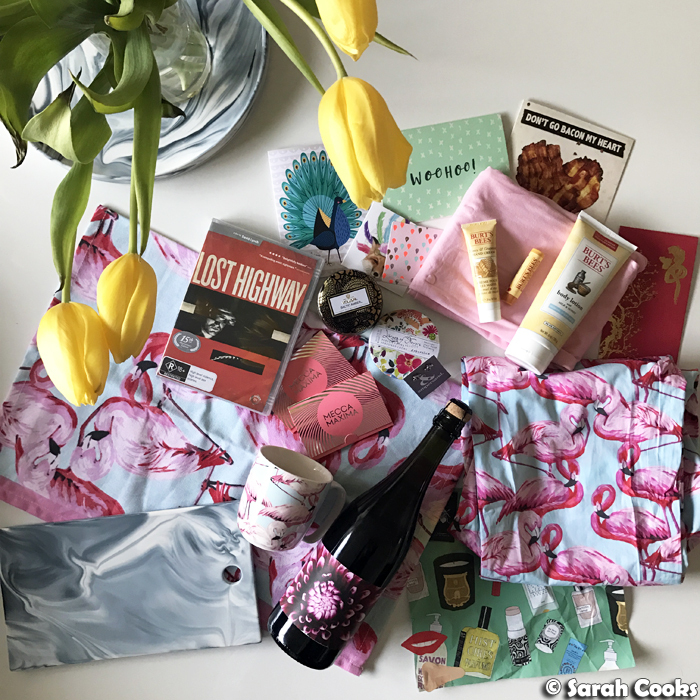 There were cute flamingo accessories, sparkling wine, flowers, cherry earrings, fragrance, a candle, goodies from Burt's Bees, Mecca vouchers, Lost Highway on DVD (scary!) and some gorgeous plates. Not pictured: tickets to a Good Beer Week dinner, a massage voucher (I used that one immediately), and a weekend away! Feeling very loved and lucky! Are birthdays a big deal for you? Do you like to do one big celebration? Or drag it out as long as you can? Do you have any fun birthday traditions with your friends or family? Good morning to you all! New meal prep Monday post for you today! We've got a vegan green rice burrito bowl. 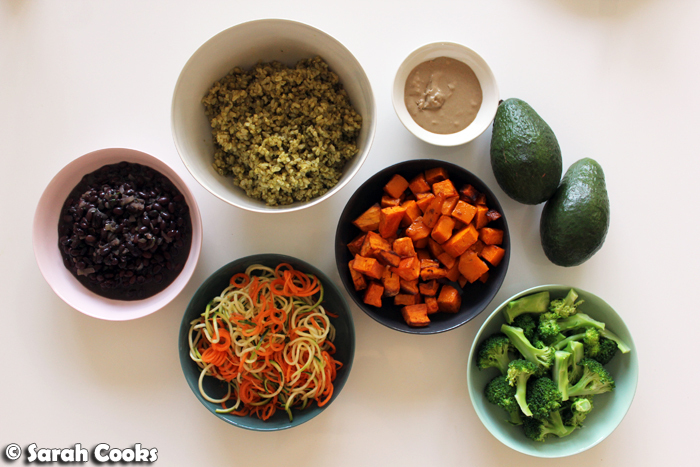 It's spicy green rice, frijoles negros, roast sweet potato and pumpkin, zucchini and carrot noodles, tahini sauce, boiled broccoli and sliced avocado. 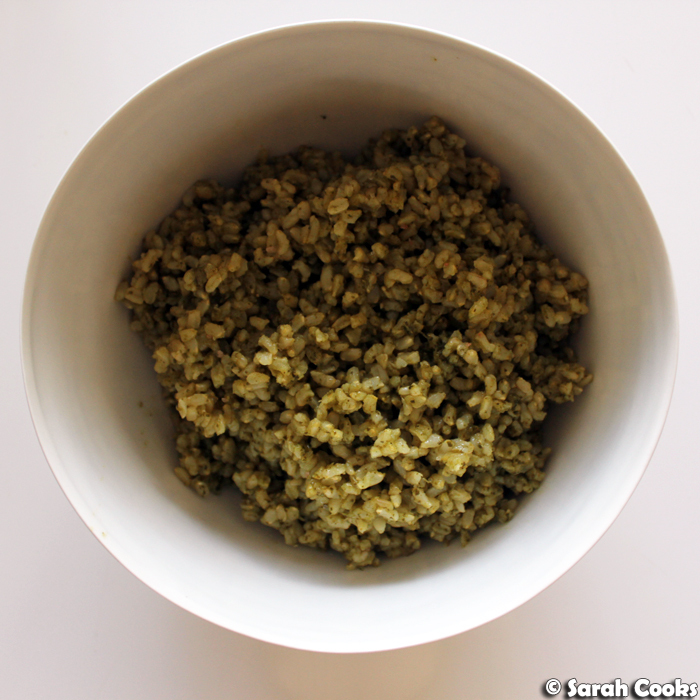 The basis of this meal is a fab herby green rice, which I found on the blog Cookie and Kate. Rather than cooking the brown rice in plain water, it's cooked in a pungent mixture of spinach, coriander, jalapeño, onion and garlic. 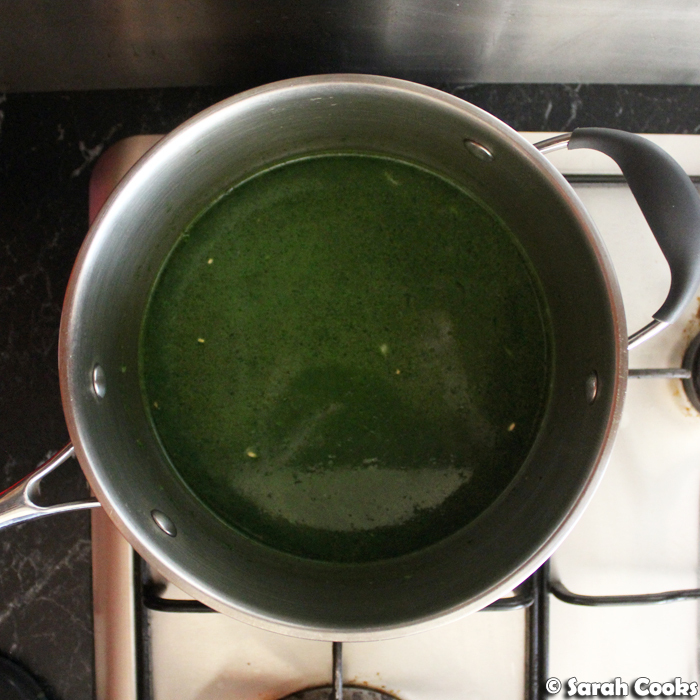 I love how ludicrously green the cooking water becomes. Ta-dah! Brown rice can be bland, so this is a great way of infusing the rice with lots of flavour. What a great idea! For the other ingredients, I went with a vaguely Mexican theme - good old frijoles negros, sliced avocado, and spicy roast sweet potato and pumpkin. And I added some boiled broccoli and spiralised zucchini and carrots, because vegetables. And some tahini sauce, because everything is better with tahini! We'd actually been to the market that day with a friend of ours who wanted to start meal prepping too, and we bought heaps of vegetables to cook together! (Her meal prep included grilled teriyaki chicken, Chinese broccoli, pickled ginger, pickled cucumber, zoodles, some of the roast sweet potatoes/pumpkin, pickled ginger, and plain brown rice). As I was putting the bowls together, I realised that this was an accidentally vegan meal. With heaps of different vegetables (are we doing the 10-a-day thing? 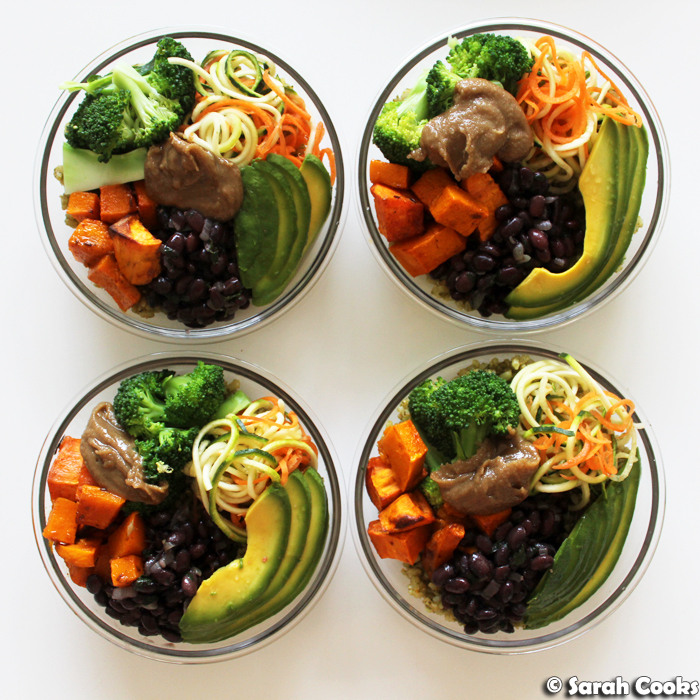 ), fibre-filled brown rice, protein from the black beans, and healthy avocado fats, all in the one easy-to-eat bowl! Place 3/4 baby spinach leaves, 1/4 cup fresh coriander, 1/2 jalapeño pepper (seeded), 1/4 onion, 1 garlic clove and 1/4 cup water in a blender and whizz to combine. Heat 1 tablespoon oil in a saucepan. Add 3/4 cup brown rice and stir until toasted. Pour the blended green mixture into the rice and stir to combine. Add 1.25 cups water to the saucepan. Bring to the boil, then clamp on the lid and turn the heat to very low. Allow to cook for 30 minutes. Take off the heat and let the rice sit, covered and undisturbed, for a further 15 minutes. Remove the lid and allow to cool completely. Preheat the oven to 220C. Peel a small sweet potato and cut into 2-cm chunks. Peel a similar sized piece of pumpkin and cut into the 2-cm chunks. Place the pieces into a baking tray. Drizzle with a little olive oil and season with cumin seeds, paprika, salt and pepper to taste. Stir to coat the vegetable pieces evenly. Bake for 15 minutes or until soften and lightly browned. Mix together 2 tablespoons tahini, 1 pinch of sugar, 1 pinch salt and a squeeze of lemon. Heat 1 teaspoon olive oil in a small saucepan. Add 1 diced onion and 1 minced clove of garlic. Cook until softened, approx. 5 minutes. Tip in one 400g tin of black beans (liquid and all) and cook for 5-10 minutes, or until heated through. 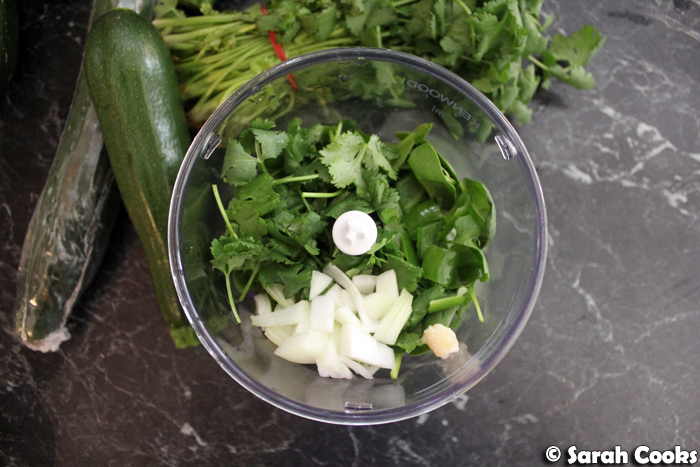 Add a pinch of cayenne pepper and a small handful chopped fresh coriander and stir through. Wash 1 small zucchini and trim the edges. Peel 1 small carrot. Put through a spiralizer. (Alternatively, grate the zucchini and carrot, put them through a mandolin or just julienne them finely with a sharp knife). Hey guys! Woah, it's the 11th day of May already and I'm just posting my April Unblogged Files! I gotta admit this one totally snuck up on me. The end of April is always a busy time for me (the last day of April is actually my birthday), and it was only after the first week of May that I realised - whoops - April was actually already over! Well, better late than never! Let's do this thing. Breakfasts! 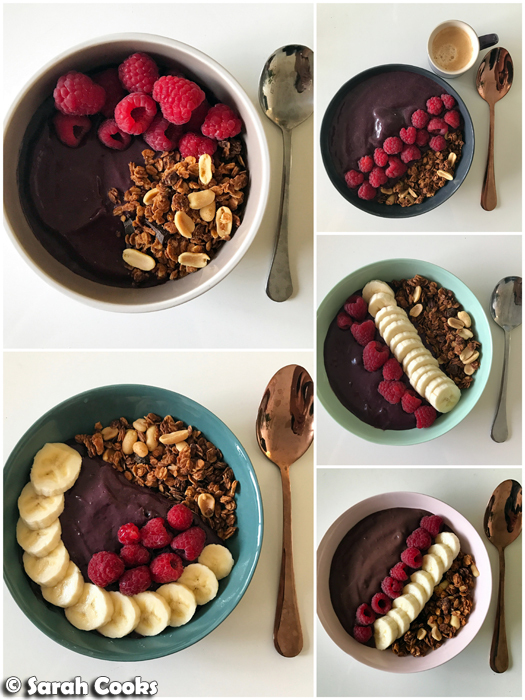 I was all about the açaí bowls and yogurt bowls this month. Not only do I wanna make the most of the fresh berries before they become prohibitively expensive, but I'm also obsessed with that peanut butter granola. I want it all the time! Some weekday lunches. I tried to mix it up a bit this month with some new places. 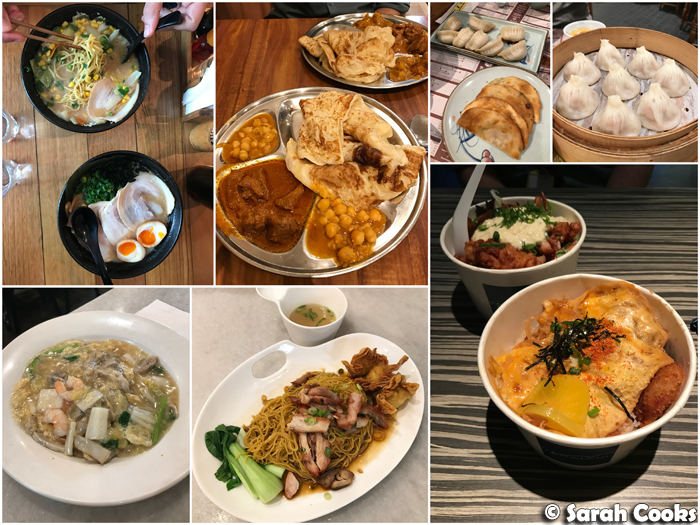 Zam Zam Cafe (364 Lonsdale St, Melbourne VIC 3000) is awesome, and does really authentic Malaysian-Indian food, and Old Town White Coffee, despite being a chain, did a surprisingly good sar hor fan (flat rice noodles in egg gravy) and wan tan mee. I was craving this type of food after writing up my Singapore post! A new city-based obsession: Kyo Tea House in Emporium. 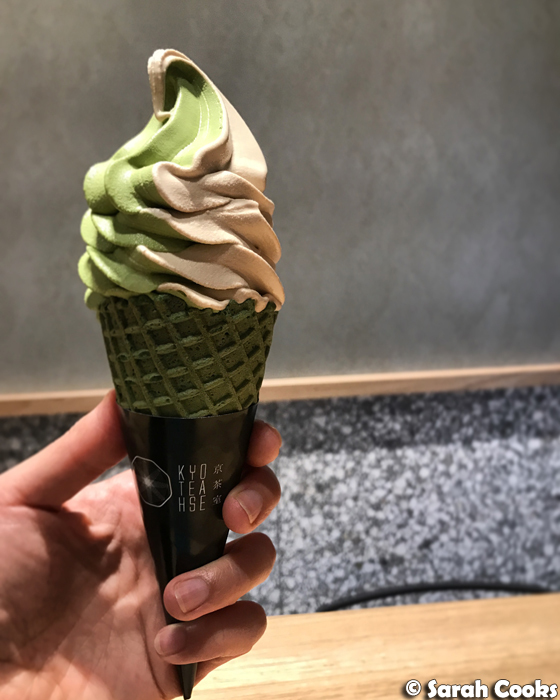 So many Japanese desserts, including matcha gelato in different strengths! I'm also excited about their big range of houjicha (roasted green tea) products. So far I've only had tea lattes and a soft serve, but I'm keen to try their full range of desserts! Here are some homecooked dinners (and weekend lunches). One day, I baked an old favourite: Nigella's dense chocolate loaf cake, from How to be a Domestic Goddess. 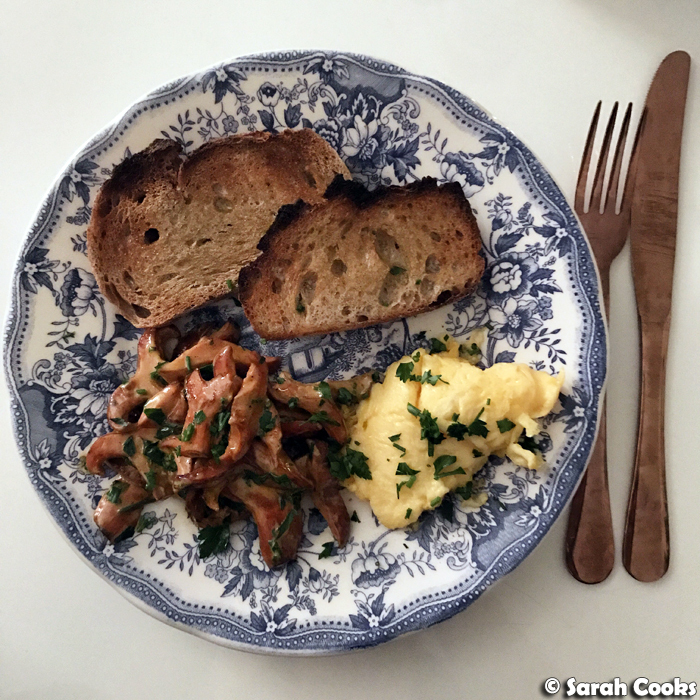 I make this quite often - it's Sandra's favourite - and I'm sure I've mentioned it here many times before, but I don't think it would hurt to remind you just how good it is! 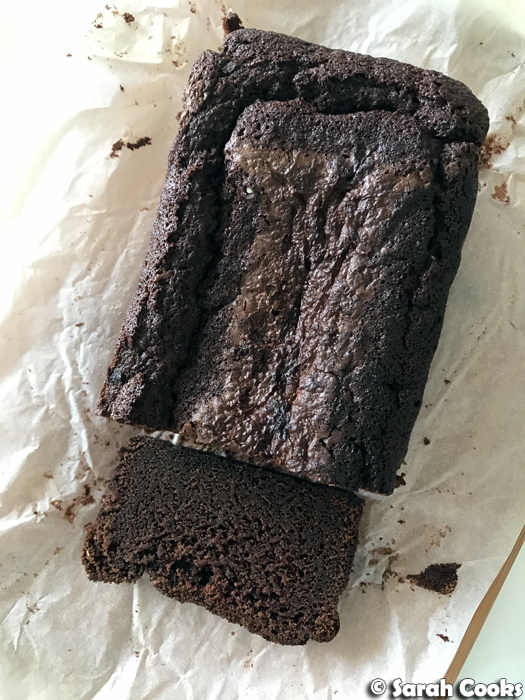 Crackly top, squidgy insides, richly chocolatey. Heaven. We happened to do two weekends away in April. (As I mentioned in my Cornflake-Crusted French Toast post). The first was to the Dandenongs with buddies Jenni and James. 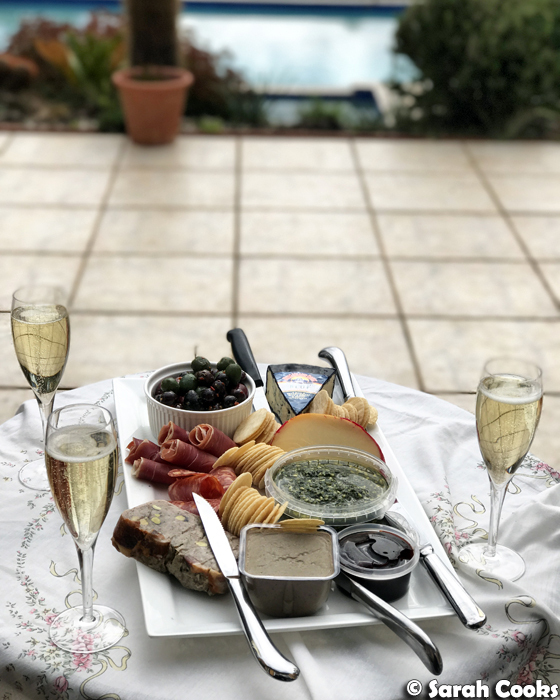 We rented an AirB&B and just relaxed - hot tub, cheese platters, the French toast, Netflix, and a fab boozy lunch at Yering Station (38 Melba Hwy, Yarra Glenn, VIC 3775). 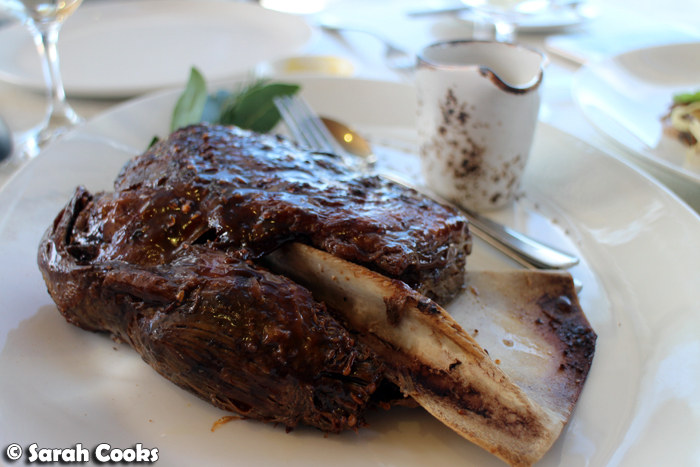 The highlight of the lunch, for me, was this behemoth of a slow-braised lamb shoulder, all melty and tender, with a sticky, delicious jus. (It comes with beans and chips, and is designed to share between two). The other weekend away was to a friend's holiday house for an even more chilled weekend. This was one of those times where we didn't leave the property and really switched off - we took a walk, we ate, we drank, we watched trashy movies and that was about it. Lovely! Of course the cornflake-crusted French toast made an appearance again, and here's a picture of the cheese and charcuterie platter of awesomeness that we enjoyed! 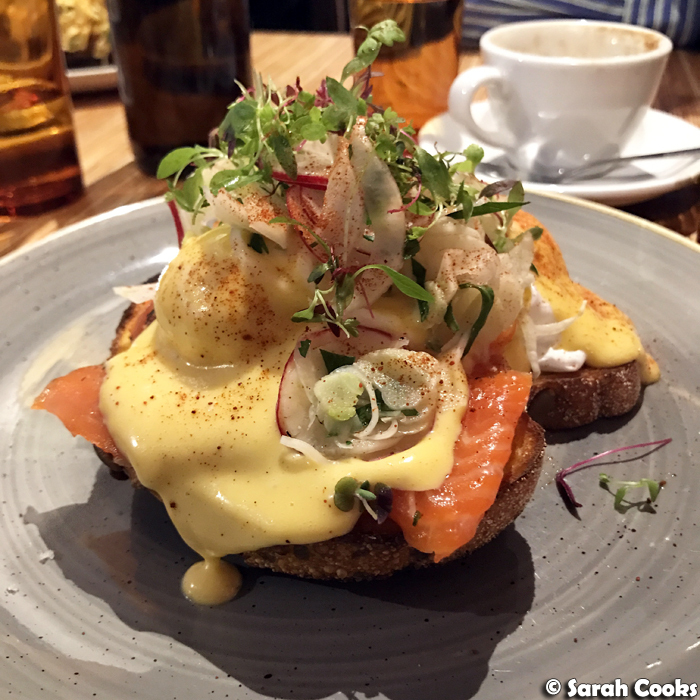 And back to city life... one morning I went for brunch at Rustica Canteen (33 Guilford Ln, Melbourne, VIC 3000). The eggs Benedict was incredible! Would definitely order again. One night we were going to Carlton for a friend's birthday drinks, so decided to get dinner beforehand at The Beaufort and Ike's (415-421 Rathdowne St, Carlton VIC 3053). This place has been on my list to visit for over two years (! ), ever since I tried their delicious BBQ at a whisky-tasting event back in 2015. It was awesome! 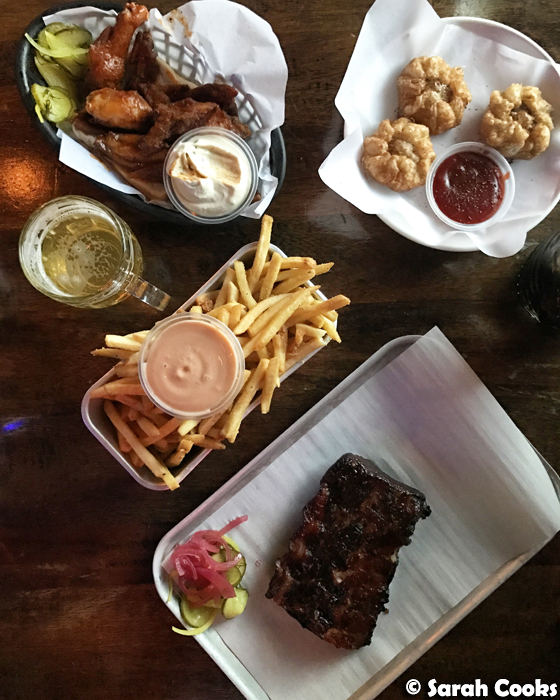 The chips, ribs and wings were all great, but the standout for me was the burnt-end pies. (Deep fried puff pastry - yessssss). 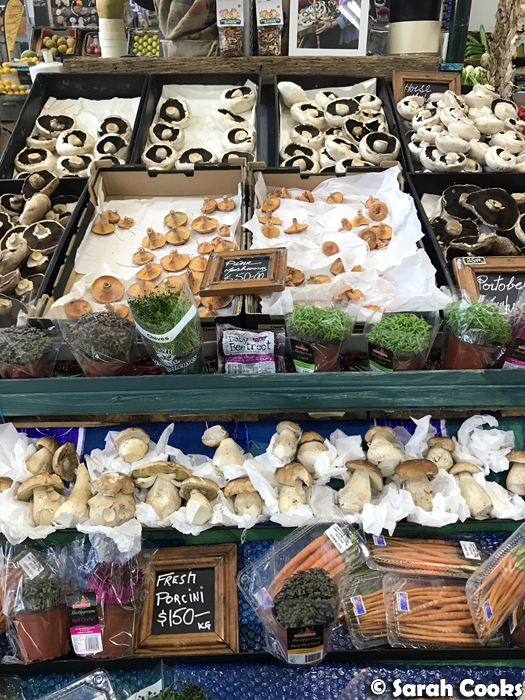 I also always love the Damien Pike stand, especially now that it's Autumn and more mushrooms are coming out. 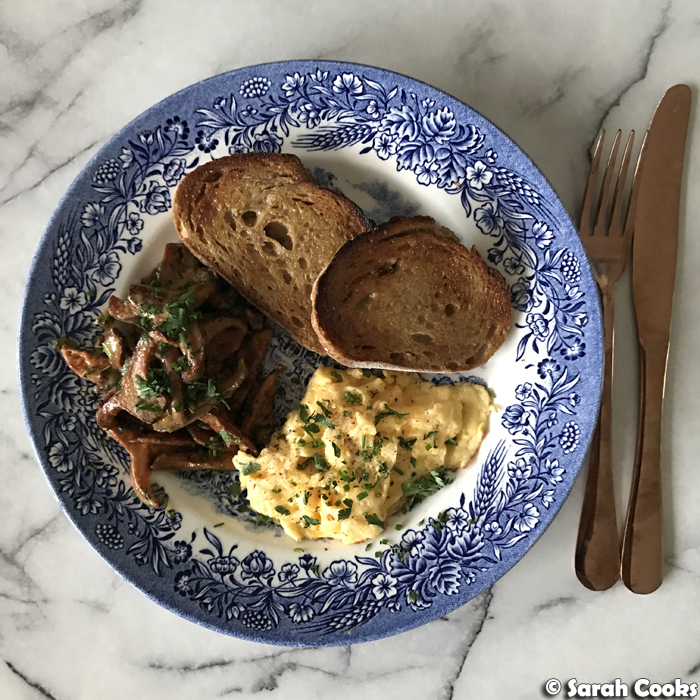 For pine mushrooms however, my favourite way (and see the full recipe here) is to sauté them in butter with garlic, cream, and a squeeze of lemon. I had this for dinner, and then breakfast the next day. Before seeing Guardians of the Galaxy 2 (I love Baby Groot! ), we stopped in for dinner at an old favourite, Monk and Me (9 Evans Pl, Hawthorn East VIC 3123). A short service announcement: their curry puffs are still the best. 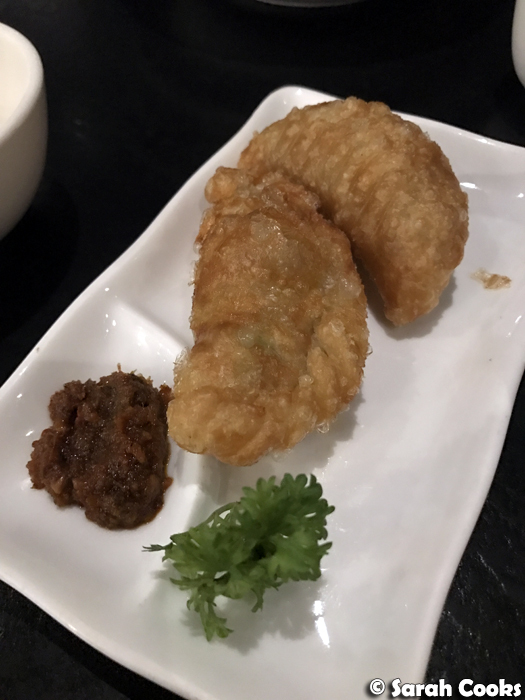 I love the crisp deep-fried puff pastry, and the punchy, deeply savoury sambal on the side. Plans for May - recover from my birthday celebrations, celebrate my dad's birthday, celebrate Sandra's birthday, and a few little dinners in between!